Yes, sorry, climate change is for real. Climate change isn’t even new, and it is obvious to anybody who studies the planet that Earth’s climate has never been static. It may only seem that way to beings with short life spans in comparison to geologic time. What’s novel this time is that we are experiencing really fast climate change over the entire globe that is obviously influenced by man-made activities. Right wing rags don’t matter. How Do We Know Climate Change is Real and Manmade? The first climate change evidence in this exhibit is the carbon dioxide graph. From NASA’s Climate Change pages (NASA does science really well), we find that the levels of CO2, a greenhouse gas, is more concentrated in our atmosphere than it has been for 650,00 years. 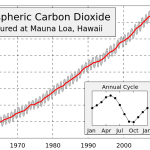 The thing is that carbon dioxide levels crossed the red line in 1950 and have continued to spike. Greenhouse gasses, like CO2 and methane, trap heat and get their name from this impact. Incidentally, there is more CO2 than methane in the atmosphere, but methane takes longer to dissipate, so that’s not a good thing either. OK, so now you know why climate change is occurring rapidly, so what’s happening? Earth’s climate has warmed about 1.4 degrees F over the last century. A degree or two here and there may not seem like much, but not all areas of the globe experience change at the same rate, so this average accounts for lower and higher degrees of climate change. But here’s the real climate change problem that we need to wake up to. The planet is expected to warm another 2 to 11 degrees F in the next century. Also, the only impact is not just warmer days but is the impact on global weather problems. Also, because warming temperatures melt ice sheets and change ocean and atmospheric patterns, some places will get quite a bit colder … for awhile. Sea levels rise: In the last 100 years, global sea levels have increased an average of 6.7 inches. In the last 10 years, the rate has nearly doubled over the average of the last century. Air temperatures rise: Over that same last 100 years, global average temperatures have increased. Most of this has happened since 1970, and the top 20 years for rising temperatures have been since 1981. Ocean temperatures rise: Part of the reason that the air temperature has not increased more is because the oceans have soaked up a lot of the increased heat. On this water planet, ocean climate change is also climate change for real. Also, oceans have become 30 percent more acid since the dawn of the Industrial Revolution. Declining sea ice and ice sheets: Both the Greenland and Antarctic ice sheets have decreased, mostly since 2002. Arctic sea ice has also declined both in area and thickness. Glaciers are melting all over the world. This includes Alaska, the Himalayas, the Alps, the Rocky Mountains, and the Andes. Also, snow cover has decreased in the last half a century, and snow is melting earlier in the spring than it used to. Extreme weather: At the same time, in the United States, the number of record high temperatures has increased while the number of record lows has decreased since 1950. Also, the number of extreme weather events has been on the rise. There is still some disagreement that humans are creating climate change, but between scientists, the consensus is clear as all that ice the planet is losing. Any student of Earth science knows that climate change happens. But there is no disagreement among scientists that the climate is rapidly changing, and the factors that are mostly responsible for that change came from human activities. As these activities increased, so did the level of greenhouse gasses and the rising mercury. People did it, but we may not be able to totally reverse it. Even if people stopped emitting greenhouse gassed and cutting down forests tomorrow, it could take 10 centuries for the world to revert back to the way it was before industry. We need to reduce it as much as we can. However, climate change is real, and we may have to adapt.